While at the beach this past weekend I wanted to check out the antique/junk shops I stop at every year in Swansboro, NC. The first seemed to be low on normal inventory, usually they have lots of neat iron or metal pieces for the yard and lots of dishes but things looked a little different. Walked away empty handed but here are a few pictures of the neat things I saw here. Starting from the top left…loved these old Dr. Pepper bottles! The cloche in the top right was super cool, I’ve never seen a green one before. I seriously thought about buying this but for $45 with a broken top it was easy to leave. The bottom two pictures show architectural features the one on the left looked like some type of decorative wall material made out of thin sheet metal, I imagined them as an interesting headboard combined together to make a big piece and painted. On the right is a stack of shutters, really considered these because I have a little project in mind and I’ve been looking for wood ones but the tall ones were the ones I liked the shape of best and they were too tall. Next stop was right next door and it had changed from previous years, for the better :) They had tons of painted furniture which gave me lots of ideas. Her furniture is lovely and well priced. This was a book shelf of sorts, but I LOVED it. I would use it as a buffet and show off dishes in the cubbies. Pretty unique piece, I have my eye out for something similar now. This inspired me to make one of those chalk boards! On the lookout for a frame now. On another note, we ate at a great place in Beaufort. The Beaufort Grocery Company and the food was incredible, the service top notch! We had our dog with us and they set us up a special dining area outside on the patio. It started raining so they moved us to the special dining room :) We felt so bad for them having to shuffle us but they were so nice! Here are some pictures of the special dining spaces! Our private dining on the patio had a very cool fence. Also loved the garden door. Saving these for future idea. Abbie getting the royal treatment…she was so good! I think she knew she was being treated well, she didn’t even beg for food! Pretty stained glass in the window inside our second dining spot. And of course the food! On the left, a crab omelet with grits and bakery items. On the right, my half eaten crab cake sandwich and sweet potato chips. Hope ya’ll enjoyed that….have you eaten anywhere that was amazing lately? 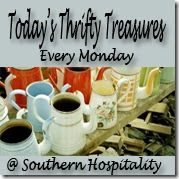 Or found any great antique spots? That sideboard and hutch are gorgeous! Thanks so much for linking up to Share the Love Wednesday!